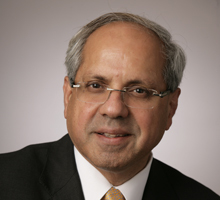 Mr. Sachdev is a director of Element Solutions Inc (formerly Platform Specialty Products Corporation, a global diversified producer of high-technology specialty chemicals and a provider of technical services), since 2016. He recently retired from his position as the Chief Executive Officer of Platform Specialty Products Corporation. Prior to that role, Mr. Sachdev served as a director and the President and Chief Executive Officer of Sigma-Aldrich Corporation (a life science and technology company), from 2010–2015 and as the Vice President and Chief Financial Officer, from 2008–2010. Mr. Sachdev also served in various executive positions at ArvinMeritor, Inc. (a supplier of automotive components), from 1999–2008. Mr. Sachdev has a B.S. in Mechanical Engineering from the Indian Institute of Technology in New Delhi, India, an M.B.A. in Finance from Indiana University, and an M.S. in Mechanical Engineering from the University of Illinois. Mr. Sachdev serves as a director of Edgewell Personal Care Products Corp. Mr. Sachdev has been a director of Regal since 2007.